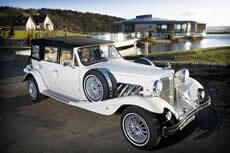 The Beauford brings the traditional elegance and charm of a bygone era. The hand-bulit Beauford based on the 1920's - 1930's Duesenberg and the Packard Eleventh Series Eight Sedan. It offers the style and finesse of these truly amazing cars with the reassurance of modern mechanical enhancements. Nuvo Limousine’s Beauford is a particularly beautiful example and is in pristine condition. Along with the antique look, the custom built Beauford has the reliability of modern mechanics. The beautiful white exterior is complimented by the high quality tan coloured leather interior and walnut finish. 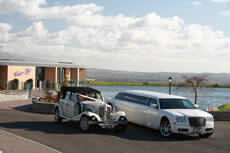 It is the most photogenic of wedding cars and is the Bride’s number one choice of bridal car. It turns the heads of everyone who sees the bride being carried to the wedding and is admired by all who have the opportunity of seeing the car on the special day. The beauty of this car will impress everyone. The Chrysler 300C stretch limousine is sleek and modern, making it the perfect limousine for any occasion. The smooth and elegant lines are complemented by classic and regal styling, earning it the nickname of “Baby Bentley”. The beautiful, chic interior is tastefully fashioned with luxurious, soft leather, lighting, air conditioning, DVD & music for all moods. It comfortably seats up to 8 passengers with the darkened windows adding to the exclusivity by providing clients with considerable privacy. 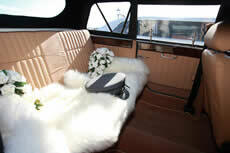 It is the sophisticated choice for the classic limo experience. It is equally refined and graceful making it ideal for bringing panache and elegance to weddings. 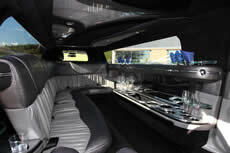 The Nuvo stretch limousine will impress the most demanding of clients as well as those who look on with admiration.